Another Hudson Bay, another three-way meet. I went to see the Hudson Bay at noon on March 30, and found a three-way meet setting up. The north track was out of service west of St. James Junction, with CN 112 coming east, and VIA 693 (the Hudson Bay) and CN 787 going west. The plan was to bring the Hudson Bay up just west of Waverley Street on the south track, followed by CN 787, then run CN 112 onto the north track and go by the two trains. At 12:24 VIA 693 crossed Waverley Street and stopped short of the CN-CP diamond. Next, CN 787 pulled up behind them. They were too far away to get shots from Waverley Street and I was not going to trespass by walking down the tracks. Next, CN 112 crossed over from the south track to the north track in front of VIA 693, then proceeded past. I pushed the limit of the zoom on my Canon S3 to get this shot. Note the solid red signals that VIA is seeing. CN 112 rolled by me. They stopped with the head end in Fort Rouge yard for a minute, then carried on again. The Hudson Bay got the green light and took off. Finally, CN 787 went by with IC 2723 and ex-BC Rail 4653. Maybe we will see if April 6 is another Three-Way Tuesday. The new edition of Canadian Railway Observations is now online. Enjoy! On Monday (March 29) I decided to shoot the Canadian at a different spot. I went west of Diamond (just west of Winnipeg) to where the track bends a bit northward. I knew I was just ahead of the Canadian and in fact as I zoomed along the dirt road at 80 km/hr I could see the headlight behind me in the distance. The hotbox at mile 10.0 said they were doing 58 MPH and they were gaining on me. I raced as fast as I dared drive on the dirt road to the bend, then pulled over and grabbed my equipment to get the shot. I think it worked out OK. I had the camera zoomed in some, as you can see, and I think it adds drama. I would have liked to pan as the Park car went by, but I had no idea if the tripod was level and I decided not to risk messing up the end of the video. There is a bubble level built into the tripod but I have learned it is not reliable. I do think the going-away shot there is a good one. I saw an interesting sight at the CEMR shops in Winnipeg yesterday. Brandt prototype genset locomotive BRTX 2009 was parked behind the shops. I had heard of this locomotive but I had no idea it was in Winnipeg. The loco has three John Deere 6135H (600 HP each), and you can see the three exhaust stacks on the very long hood of this locomotive. 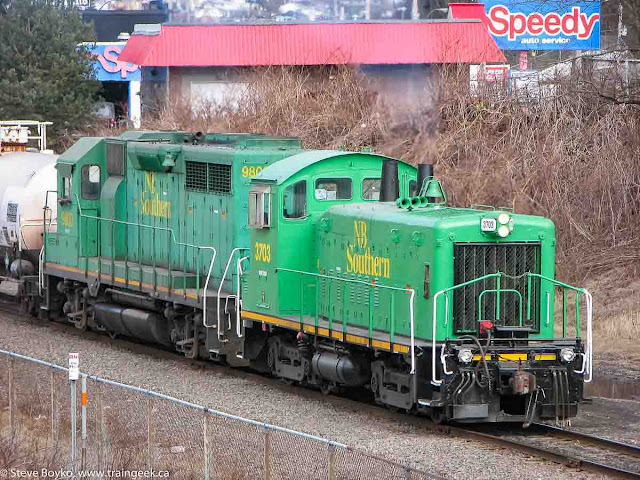 The idea of a genset locomotive is that instead of a single prime mover (engine), multiple smaller engines can be brought on or offline as required to save fuel. This locomotive is built on an entirely new frame. It was expected that Brandt would use the frame of ex-CP GP9 1592 that they purchased, but that apparently did not happen. There is a lot of detail on this locomotive at Green Rail News. CN's TEST train has been noodling around the Maritimes in the past week or so. The train had the usual two blue cars. Here's an okay video by NBEC69 of the TEST train with CN Geep 4770 pulling the train. Nice horn. Matt caught CN 305 at Berry Mills just outside Moncton with eight, yes, 8 engines on the head end. Great video. Apparently three units had come into Moncton on CN 474 and were not required, so they went right back out on 305. For the record, the units were 5774, 2418, 2527, 2619, 2226, 5757, 4774 and 4773. I went up to St. James Junction on Tuesday (March 23) to see the Hudson Bay. Another railfan, Andrew, was already there, so we chatted for a few minutes. It turned out that RTC Janice had scheduled a three-way meet, because the north track was out of service west of our location. CN 199 was waiting at Fort Rouge. An eastbound CN freight was coming in, and of course the Hudson Bay had to get out. Here's how it played out. CN 199 waited on the south track at Fort Rouge. The eastbound came in on the south track, then crossed over to the north track just west of the CN-CP diamond. This train had CN 5610 and ex-BC Rail 4644 pulling a solid container train. Here's a shot of BC Rail 4644... nice to see it on the train. They paused east of Waverley Street. The Hudson Bay appeared on the north track, and crossed over to the south track in front of CN 199 and continued up to St. James Junction. VIA could not continue any farther because the remainder of the CN eastbound was still on the south track. Once the eastbound cleared the south track, the engineer put the hammer down and rocketed out of there. Nice to get a toot from the engineer. Those F40PH-2's seem to smoke quite a bit when they are put under heavy acceleration. I didn't have time to stick around to wait for CN 199, but it was interesting to see how the meet was handled. After seeing a little NB Southern action last Friday, I hopped on a plane for Montreal. I was to make a connection there to continue on to Winnipeg, but I had almost three hours to kill in between. On a previous visit to the lovely Dorval airport, I had noticed that the Dorval train station was in easy walking distance of the airport. It was time to take a stroll over and see what I could see. There is no direct walking path between the airport and the train station. You would think there would be one, but you really feel like a trespasser tromping across parking lots and on-ramps to get to the station. Anyway, I arrived at the station. There are actually two stations, the VIA Dorval station and the AMT Dorval platforms. I figured I would get hassled less at the AMT platform so I stayed there. On the double track CN line, a CN maintenance truck waited. Shortly after I arrived, an outbound VIA train stopped at the station, then headed out. You can see the CN truck right at the start of the video. VIA 6426 pulled a short train of HEP 1 cars. Shortly after that, the CN truck left, then another outbound VIA train came, stopped, and carried on. This one had VIA 913 and three LRC cars. After that flurry of activity, things settled down for a while. There were a few passengers drifting around the platform but not a lot of activity. The sun was beginning to go down but there was enough to see an outbound AMT train come in and depart. AMT 1320 was pushing on the end pretty hard as they left the station. Right behind that train was another set of headlights. It turned out to be a CP intermodal rolling through the station. I like the sunset reflecting off the sides of the containers. I figured my time was up, and the light was fading, so I walked back to the airport and caught my flight with plenty of time to spare. I might have to arrange future flights to have a little layover in Montreal again! PS it turns out there is a shuttle bus between the station and the airport. Who knew? VIA Rail announced that hot meals will be reinstated on the Chaleur (the Montréal ― Gaspé train) year-round. Snacks will be replaced by hot meals prepared by Newrest, the same company that provides meals on the Ocean. The dining car will return from June to October and over Christmas. A joint VIA - Gaspé working group was also created to "study ways of enhancing service on the Montréal-Gaspé line and promoting tourism in the region." A great idea, I think. One note from VIA's president and CEO, Marc Laliberté: "the financial bottom line is not optional, but mandatory." Translation: USE IT OR LOSE IT. A fair statement, I think. Hopefully VIA's customers, after blockading the line and protesting in many other ways, will step up and use the dining service they fought for. Two "new" engines have been acquired for the Windsor & Hantsport Railway in Nova Scotia. These are Conrail painted GE B23-7 units. The two former Conrail engines (now relettered WHRC 1968 and 4069 under the numbers) arrived in Halifax this morning on train CN 120. They had spent several days in Moncton. Here they are at Bayview Junction in Ontario. Here they are in Tennessee, I believe. The discussion on their journey is here. turned a wheel in service. Both are in Conrail blue, with #1968 in nearly pure CR paint and markings while #4079 had the original number patched while in operation on NS and later had CR markings painted out when acquired by National Railway Equipment." I was heading down to the airport in Saint John this past Friday to head home. I had a few minutes extra, so I took the long way across Reversing Falls rather than use the toll bridge. Just after I crossed the Reversing Falls I saw an NB Southern Railway engine running light toward Island Yard. I was able to get ahead of NBSR 2610 and shoot it at Fort Latour. After that, I proceeded up to Somerset Street and waited to turn left onto the Highway 1 onramp. To the left I saw another train! What luck. When I made my left turn, I pulled onto the side of the ramp and jumped out to take this video of NBSR 3703 and 9803 pulling a short transfer freight. NBSR 3703 looks nice in her fresh green paint. I had never considered this angle before, mostly because you have to drive west on highway 1 after the shot, but I like it! Right after that, I saw CN 406 arriving in Island Yard with CN 8864 and CN 5770, but by then I was doing 100 km/hr and stopping was not an option! I hit the road for the airport, and after enjoying their free wireless access, I was on my way to Montreal... for more railfanning. March 16 "Old Green Friends"
Bending our backs til the long days are done"
You may recall that the provincial and federal governments announced $18 million in funding for the NB Southern Railway last July. I saw some of that money being spent this past Thursday (March 18). I was driving along the line and at about mile 8 I saw the strangest sight... a toilet on wheels. The port-a-potty was being pushed by an MOW vehicle and it was headed for Saint John. Less than half a mile away, a maintenance-of-way (MOW) crew with several vehicles was hard at work replacing track. There were about eight guys hammering away while a machine nudged the new rails into position. Beyond that, spiking machines finished the spiking job and ballast resurfacers went to work. I spoke with one gentleman, from McAdam, and he said they were working their way out from Saint John. They have a long way to go! NBSR 2318 and slug 008, together with NBSR 2319, pulled a fairly short train of gypsum empties, centerbeam flat empties, and a single boxcar. I was glad to see the slug, finally. I returned to Saint John at close to midnight. As I was driving past Island Yard, I spotted a train coming into the yard from the west / north. I drove up to where a new overpass is being built by Russell Street and set up. Soon enough I heard the bark of an SD70M-2's horn as CN 8864? and CN 5770 brought a potash train past on the way to Courtenay Bay. I believe this was train 594, which is run occasionally using CN 406's power to ferry potash cars. They came to a stop so the conductor could cross the street and line the wye switch toward Saint John. Since it was just before midnight, it was time for me to get to bed to rest up for the next day's work. There must be something in the air. There has been a flurry of interest in cabooses these days. First I was contacted by someone looking for a caboose in Ontario. I pointed them to Ron Grant's caboose in Hillsborough, because it's for sale. Next I hear that a lady in Meductic is trying once again to sell one of the cabooses there, for a reputed $10k. The photo at top is one of the two cabooses there. I shot that about 10 years ago. Next, someone pointed out a Kajiji listing for an ex-CN caboose for a whopping $18,900 (or best offer). Don't get me wrong, owning a caboose would be cool. However, I think $10,000 (or more) might be a bit steep for a caboose, especially the ones that seem a little shabby. The biggest problem is that they are all sold "as is, where is" and the costs of MOVING a caboose are substantial and could easily exceed the purchase price. Still, a caboose would make a great cabin. I've had breakfast in the cupola of a static caboose and you can't beat the view. EDIT 2012/05/17 - ex CN 79532 has been sold and is en route to British Columbia. I'm in Saint John, NB this week for training. I was able to do a bit of railfanning after work yesterday (March 16). I took a look at Island Yard and saw old friend CN 7038 shunting. I headed down toward Dever Road and caught up with the tail end of the transfer freight at Reversing Falls. I wasn't able to get to the head end until they pulled all the way through the yard and started shunting the west end of Dever Road yard. NBSR 2610, NBSR 3703 and NBSR 9803 were working hard. I watched them do their work for a while, taking a few shots and video but mostly just listening to the engines do their work. After all, it's been over 8 months since I've seen NB Southern. Time flies! The Fredericton station is coming along nicely. I saw it Monday (March 15) and the roof appears to be done. The trim along the edge of the roof needs to be put in, and the column at the front needs to be replaced. There are piles of materials taken from the station around the site, including the original bricks. No doubt a few people have taken a brick or two as a souvenir. tjmfishing sent me some great photos of his grandfather's retirement in Campbellton, NB. Leslie Main retired on June 9, 1982 and appears to have had a good sendoff. They are standing in front of RS-18 CN 3624. Note the CN transfer caboose in the background on the left. Leslie is the one in the blue hat looking down at the papers in his hand. Leslie at the controls. Note the data on the side of the locomotive. CN 3624 was built between 1956 and 1958 by the Montreal Locomotive Works (MLW) as class MR-18b. The 18 indicates 1800 horsepower. The data 75-65/18 indicates that the maximum speed was 75 MPH and 65:18 indicates the gearing on the traction motors. David Othen shot CN 3624 in Halifax several times in 1973. Ron Leblanc indicated that 3624 was involved in an accident shortly before the 1982 photos were taken and was repainted. CN 3624 was leased to CP Rail between April and July 1987, and was retired on July 30, 1992. I went out on Thursday (March 11) to shoot the Canadian. I decided to head west on Wilkes Avenue to get a little away from my normal shooting area. Variety is good, right? There were some MOW crews at work on the north track around miles 8-10, including a pickup with a guy doing some grinding, ballast regulator 613-70, and another vehicle further east. They must have been wrapping things up, because the regulator and the other vehicle headed east at speed. See how fast this guy was going! I waited in the mud for the Canadian to show. Soon enough, he passed me at mile 8-something. View train consist. Prince Albert Park brought up the markers. "Back in the day", McGivney, NB was a happening place. It was where the CN Miramichi subdivision (McGivney - Newcastle) and the CN Nashwaak subdivision (McGivney - Fredericton) met the CN Napadogan subdivision (Moncton - Edmundston). Freight and passenger trains rolled through on the Napadogan sub, while local freights went north and south on the other two subdivisions. In time, the Miramichi and Nashwaak subdivisions were abandoned, and all that remains is the Napadogan subdivision with its occasional freight trains. Danny McCracken noted that the book "History of Boiestown" says the last passenger train between Newcastle and Fredericton returned on January 19, 1961 with CN RDC-3 D354. Here are a few shots of passenger trains that called on McGivney. At one time the Napadogan subdivision hosted RDC service. On August 28, 1976 David Morris shot train 619 at McGivney. For whatever reason, this particular train had conventional power on the head end with an RDC on the tail end. I find it strange that there was a steam generator car on the train in August! For about six months, VIA ran the Ocean over the Napadogan subdivision due to a landslide in Quebec. David caught train 14 at McGivney on February 12, 1977. Since the cessation of passenger service on the Napadogan, the only passenger trains that can be seen at McGivney are the occasional Ocean detours. David and I shot the westbound Ocean, VIA 15, on July 10, 2005. I shot the eastbound Ocean at the west end of McGivney siding on September 14, 2008. This may be one of my last photos of VIA 6400, given its involvement in the recent derailment. Who knows? Maybe groups like Transport Action can get the various levels of government to increase passenger rail service in New Brunswick, and McGivney could get regular passenger service again. Hope springs eternal! Myrailfan.com has a great list of VIA F40 engines and their disposition. It was being kept up to date but there is a note at the top that seems to indicate it will no longer be updated. Still, it's a useful reference. After all the blog-changing excitement of the weekend, it's back to trains again. Today I went to Waverley Street here in Winnipeg to try to shoot VIA's Hudson Bay train. I didn't see it, but I did see this CN westbound freight. Just east of Waverley Street, a CN maintenance of way (MOW) crew were doing some welding on what appeared to be the crossover switch points. As the freight approached at 12:15, they took position on both sides to give it the proper rollby inspection. CN 2231 and old warhorse 5295 pulled a dog's breakfast of cars behind them. Normally I stand on the south side of the tracks in this area, to have the sun behind me. However, since it was overcast, I elected to stand on the north side of the tracks to get a different viewpoint. On March 2 a train (VIA 300) went up the Montmagny subdivision to the VIA derailment site at St-Charles, Quebec, to bring the damaged train back to Montreal. The cars they brought were to provide braking power for the train, as they can't trust the damaged train to have proper brake connections. The train had ex-GO 521 for power, with Chateau Closse, and coaches 8132 and 8112. At the time, all the damaged cars were on the track, with VIA 6400 coupled onto the Skyline facing east and VIA 6457 a couple of cars further facing west. Ron Pelletier reported that VIA 303 left Joffre at 21:30 on March 3 heading west to Montreal, with the entire train. They had to proceed at a maximum of 20 MPH and stop and inspect every hour. Canadian Pacific Railway had a derailment west of Golden, BC on March 3. It was reported (Golden Star) that an eastbound (empty) grain train and a westbound potash train collided at 3:14 PM local time. This photo shows two locomotives on the ground, including one on its side. One of the locos involved is CP 8628, and someone mentioned Olympic unit CP 8874 was also involved. If you browse through the album, you can see the extent of the accident. Fortunately, the crew sustained only minor injuries. There was a small fire in the area, because the derailment took out the propane tank for the switch heater. The Golden fire department contained the fire. There was a small amount of diesel fuel spilled. You can see a fair amount of potash on the ground in the photos. Another news report said "An eastbound freight hauling empty grain cars clipped a westbound train carrying potash." Sorry if you were unable to access my site today. I was doing a little maintenance and messed up the domain name for a few hours. Ooops! This blog is now located at http://blog.traingeek.ca. You may click here to see it at the new location. For feed subscribers, please update your feed subscriptions to http://blog.traingeek.ca. This video is a safety video from Network Rail, a UK rail company. The theme is "Hit or Miss - Lives are Ruined". WARNING - graphic content, including language. What an age we live in. If you step back and look at the progress made in photography in the past 15 years, it's amazing, isn't it? Apple and Kodak were among the first in digital photography with their first consumer digital cameras, the Apple QuickTake 100 in 1993, and the Kodak DC40. Both had less than half a megapixel resolution. My dad used to carry around a clunky digital camera that could record images on a 3.5" floppy disk. A decade and a half later, it is embarrassing to have a CELLPHONE with that kind of resolution. A quick browse of FutureShop or other web sites shows that 10 megapixel pocket cameras sell for $99. for half the price... 512 times the memory in 8 years. Secure Digital (SD) cards are the most common technology and you can find 4GB SD cards for $15 or less. One thing you MUST keep in mind is that you get what you pay for, as always. These el-cheapo memory cards may have that storage, but they are not very fast. To give you an example, I purchased a pair of Kodak 4GB SD cards at the Wal-Mart photo studio a month or so ago for $25 or so. These "made in Korea" cards are fine for storage, but they are not fast cards. SD cards are often rated as a number followed by an X. For example, "16x". This page does a great job explaining what it means. It boils down to a multiple of 150 KB/s, so a 16x card can handle 2.4 megabytes/s. My Canon S3 is rated at about 1.5 frames per second continuous shooting. A decent SD card can keep up with that. However, these Kodak cards cannot. I typically shoot passenger trains on continuous shooting so I can record every car number. I noticed it on Tuesday when I was shooting the Hudson Bay that I kept seeing "BUSY" on the screen when I was blasting away. Basically the camera kept having to wait for the card to finish. You can see it on this BNSF video. It looks like it is snowing, but it is not. That is digital noise, caused by the card not being able to store the video fast enough. Let's do the math. Each full resolution JPEG coming out of my camera is about 2.7M in size, on average. Shooting at 1.5 frames per second, that is just over 4 megabytes/second. This would require about a 27x card. These el-cheapo Kodaks are clearly no more than 16x speed and cannot keep up. Needless to say, these Kodak SD cards are going to be used in the Wii or other low speed applications, and I'll go back to my older, faster card. It's only 2 GB but it is fast enough for my camera. I shot a "twofer" of passenger trains early this week. The first was the Canadian on Monday. I decided to head to Waverley Street to shoot it, given the mild weather. It's no fun to stand there in -30C temperatures, believe me. I parked and started jogging to the tracks. Just as I arrived, I saw the Canadian and the crossing lights came on. I barely had time to get my camera out! I guess they made very good time from the station. On Tuesday I went up to Waverley a few minutes earlier to ensure I had time to set up. As I parked an eastbound CN freight was rolling through the crossing with CN 8852 and CN 8869 for power. I think it must have been CN 114, given the time and the mixed freight on the head end followed by containers. One unusual thing in the consist was a few trailers on flat cars (TOFC), something you don't see very often these days. The Hudson Bay (VIA 693) was very prompt on Tuesday. Track inspection car CN 1501 was in Winnipeg last week. You may remember that it visited the Maritimes last April. It laid over at the Fort Rouge yard on February 25, and headed west in the morning of February 26. Jeff Keddy gave chase and took some great photos. Jeff shot it first near Fort Rouge yard. Here you can see the CN Subway sign to the right, and the VIA maintenance center in the background to the right. Next he shot it at St. James Junction, going over the CN-CP diamond. Jeff said that 1501 was only going 30 MPH so it was possible to keep up with it and get some shots on the way to Portage la Prairie. They stopped just west of Diamond to drop off a couple of employees. Here's a closeup of the end of the car, showing the CN Engineering logo. CN 1501 was running as train #489. Here it is just west of Elie, Manitoba. Next, the elevator at Oakville, MB. It stopped again in Portage la Prairie at the station to make a pickup. Thanks to Jeff for sharing such great shots! There has been some debate on the Canadian Passenger Rail group about surviving railway stations in Canada. I wanted to post a few links from that debate for your (and my) reference. The federal Historic Sites and Monuments Board of Canada has a list of Designated Heritage Railway Stations in Canada. The CNR in Ontario site has a list of railway station reports for Ontario. You must take all of these lists with a grain of salt. There will be inaccuracies in any list.